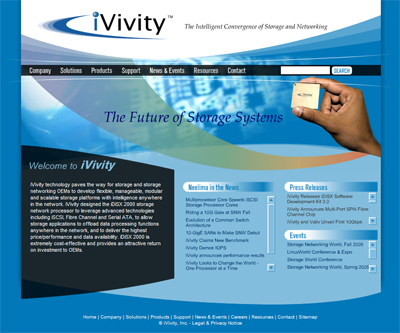 iVivity is a Norcross GA emerging technology firm with sound financial backing. They are three weeks from a Board of Directors meeting and they need to completely redesign their website. They have been interviewing web companies for two months and had decided on a winner when they were referred to XI Interactive by local graphic artist, Gama Design Studios (gamads.com). The marketing team needed a player that could deliver and in two short meetings we proved to them that we were the team for the job. The Board of Directors meets in two weeks. The Client wants to redesign the web site adding new dynamic features and CMS functionality. The new website needs to feature the companies core competencies and product lines. Well, this is challenge enough if all of your content is written and approved, something that iVivity assured us was already done. But no sooner had we begun assembling and implementing the new content and we found out that decision-makers in the company were still rewriting it. In fact, there were many iterations and the rewriting process continued right up to the hour before the presentation to the Board of Directors. With all of the focus on new content and new applications, we knew that we would be shallow on the design with so short a time to incubate a proper creative process. We had to meet the short-term goal for the board meeting, but we had to meet the long term goal of a beautiful web site that made iVivity a memorable web experience. The user wanted a simple CMS to keep the budget down. We designed a website driven on a database that could be updated at the webmaster&apos;s desktop and then synchronized with the web site which instantly updated its content. The database design included applications for press releases, executive bios, white papers, iVivity in the news, job recruitment, and more. For the design, we offered a phased approach - put up a design that looks good for the board of directors presentation, and then when the dust settles and we can do a proper creative process, we would create the design to meet the long-term goals. The database CMS application proved easy to use for non-technical personnel responsible for the maintenance of the site. The design was truly gorgeous and left such an impression that the company began using the web design elements on other company collateral such as trade show booths and brochures.